Summer in Denmark means eating lots and lots of koldskål, which is a cold buttermilk soup with vanilla and lemon. There are lots of ready-made variations in the grocery stores, some are better than others so the past few years I have made my own. It’s really easy to make and I don’t have to worry about which preservatives have been added. And I can also make my own variations. Like this strawberry version which is so much better than the store bought strawberry version. You just can’t beat fresh strawberries. I also baked a batch of biscuits called kammerjunker, which what we usually add to the soup. They are small, light and crunchy biscuits with lots of vanilla. I bake a large batch and store them in an air-tight container so I have enough for the summer. Beat the egg yolks, sugar and vanilla sugar until the mixture is stiff and sugar is dissolved. Pour in the buttermilk and season with lemon juice and a little grated lemon zest. 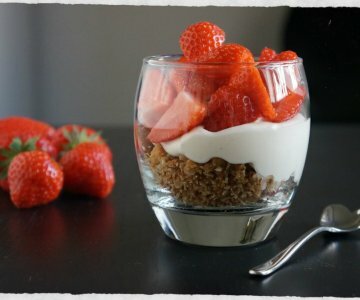 Blitz strawberries in a blender and stir into the buttermilk soup. 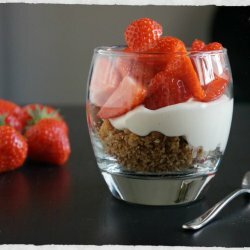 Serve with fresh strawberries and kammerjunker biscuits or a bit of granola. Ingredients – (for the biscuits) -2 baking sheets, about 100 pcs. Mix the flour, vanilla sugar and baking powder together in a bowl. Crumble the butter into the flour mixture, add sugar and beaten egg, and knead just until you have a firm dough. Form dough into rolls and cut them into small cubes. Place them on the baking sheet and flatten with a finger.